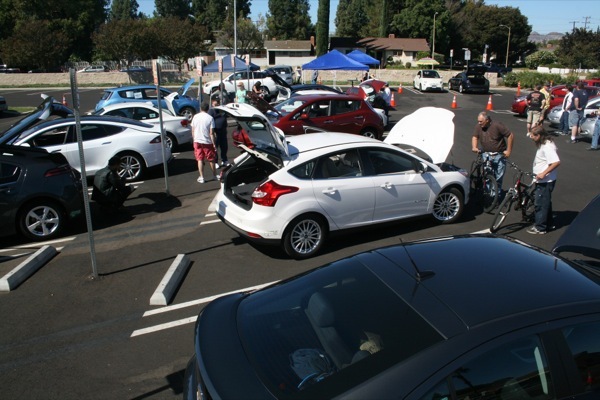 Dozens of electric vehicle drivers and enthusiasts will meet together to highlight the fun, clean-air benefits, and cost-savings of electric cars on September 29. THIS IS THE ONLY SUNDAY EVENT IN LOS ANGELES COUNTY. The event is part of the third annual National Plug in Day. Dealerships including Zero Motorcycles and Nissan will bring cars with product specialists to give test drives. Similarly, various electric vehicles from Tesla to Chevrolet will be present. Northridge’s event is one of more than 60 across the country where electric vehicle owners and their neighbors will hold electric car, “tailpipe-free” tailgate parties, recognition of leaders; promoting EVs, launches of new public EV charging stations, and other public events. Bring your car, or just stop by to see the technology of a gas free lifestyle. Owners can talk, and enthusiasts can test drive the vehicles. Cars include the BMW Active E, which less than 600 were released or the Nissan Leaf, which is the best-selling electric vehicle of all time and everywhere in between. Nissan of Woodland Hills will be sponsoring the event, and offering test drives in the all electric Nissan Leaf. Please RSVP so that we can get a general head count. All plug in electric vehicles are welcome! More to be announced later.